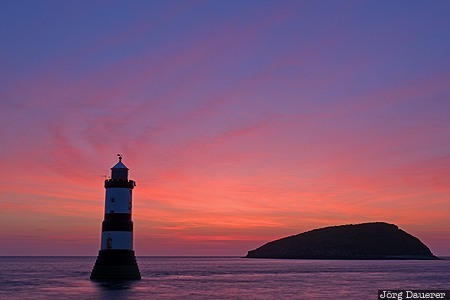 A colorful sunrise above Trwyn Du Lighthouse (or Penmon Lighthouse) at the north entrance to the Menai Strait with Puffin Island in the background. Penmon is on Isle of Anglesey in the north of Wales, United Kingdom. This photo was taken in the morning of a sunny day in June of 2015. This photo is part of the exhibition Lighthouses of Northern Europe (Oct'15). This photo was taken with a digital camera.